This is the fine white-flowering hardy Magnolia, producing large pure white goblet shaped flowers on bare stems each Spring. Jade Lamp is a recently introduced variety, a specially selected denudata type, particularly noted for the large size of its solid white flowers, plus ability to flower at a small size. Our plants on the nursery have already bloomed, and we can confirm this is a very good variety to have in your garden. 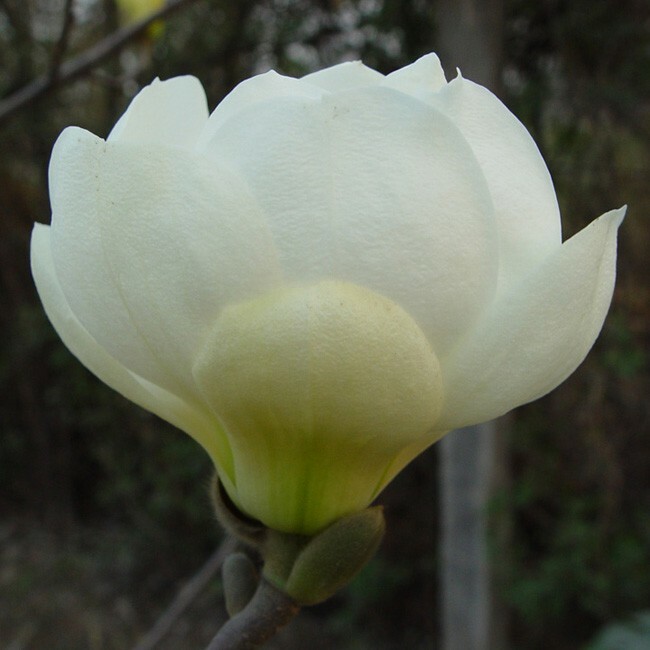 Magnolias such as 'Jade Lamp' have been cultivated in Chinese gardens for centuries, and was known as ''Yulan'' or ''Jade Orchid'' to the ancient Chinese having been cultivated since the 7th century in Buddhist temple gardens. Its flowers were regarded as a symbol of purity in the Tang Dynasty and it was planted in the grounds of the Emperor's palace, he was sure to appreciate the dazzling citrus-like fragrance. Its beauty was celebrated on ancient Chinese embroideries, scrolls and porcelains in scenes of the countryside. Its elegant flowers made it "a gift worthy of an emperor. " making it popular as a special gift today. Plant where a backdrop of dark green foliage is possible to provide a dramatic contrast to the flowers and the lime green summer foliage or simply use towards the back of in a mixed shrub border. It is also exquisite as a solitary specimen forming a small tree over time, even used in a large patio planter for something unusual. This Magnolia is a real investment and will provide decades of pleasure in any garden. Supplied in approx. 3 litre containers at around 80cms tall.